Thallium (chemical symbol Tl, atomic number 81) is a soft, malleable metal. When freshly cut, it looks like tin, but it discolors to gray when exposed to air. This element and its compounds are highly toxic and need to be handled with extreme care. It has been used in a number of murders, earning the nickname "inheritance powder," alongside arsenic. Despite their toxicity, thallium and its compounds serve many useful purposes. For instance, thallium is used in certain semiconductor materials and gamma ray detectors. Thallium oxide has been used to manufacture glasses that have a high refractive index, its sulfide is useful in photocells, and its amalgam (alloy with mercury) is used in thermometers for low-temperature measurements. Crystals of thallium bromide-iodide have been used as infrared optical materials. Some thallium compounds were used in the past as rat poisons and insecticides, but those uses have been discontinued in many countries, based on safety concerns. 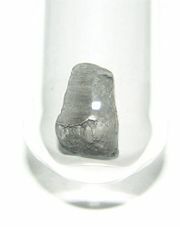 The element thallium is reasonably abundant in the Earth's crust, at a concentration estimated to be about 0.7 milligrams per kilogram (mg/kg). It, however, exists mostly in association with potassium minerals in clays, soils, and granites, and it is not commercially recoverable from those forms. The major source of commercial thallium is the trace amounts found in the sulfide ores of copper, lead, zinc, and other metals. Thallium is found in the minerals crookesite (TlCu7Se4), hutchinsonite (TlPbAs5S9), and lorandite (TlAsS2). This metal is also contained in pyrites and is extracted as a byproduct of sulfuric acid production when pyrite ore is roasted. Another way this element is obtained is from the smelting of lead- and zinc-rich ores. Manganese nodules, which are found on the ocean floor, also contain thallium, but nodule extraction is prohibitively expensive and potentially damaging for the environment. In addition, several other thallium minerals (containing 16–60 percent thallium) occur in nature as sulfide or selenide complexes with antimony, arsenic, copper, lead, and silver, but they are rare and have no commercial importance as sources of this element. Thallium (from the Greek word τάλλός, meaning "a green shoot or twig") was discovered by Sir William Crookes in 1861 in England while he was making spectroscopic determinations for tellurium on residues from a sulfuric acid plant. The name comes from thallium's bright green spectral emission lines. Crookes and Claude-Auguste Lamy isolated the metal independently of each other in 1862. In the periodic table, thallium lies in group 13 (former group 3A), which is the same group as aluminum, gallium, and indium. Consequently, its properties resemble those of these three elements. In addition, it is situated in period five, between mercury and lead. It is also said to be one of the "poor metals"—elements located between the transition metals and metalloids in the periodic table. Thallium is very soft and malleable and can be cut with a knife. When first exposed to air, it has a metallic luster, but it quickly tarnishes to a bluish-gray tinge that resembles lead. A heavy layer of oxide builds up on thallium if left in air. In the presence of water, thallium hydroxide is formed. To preserve the metal, it is stored under oil. Thallium has 25 isotopes, with atomic masses that range from 184 to 210. Among them, 203Tl and 205Tl are the only stable isotopes. The radioisotope 204Tl has the longest half-life—estimated at 3.78 years. Thallium and its compounds have a number of uses. Some examples are as follows. Thallium sulfide is useful in photocells because its electrical conductivity increases when exposed to infrared light. Crystals of thallium bromide-iodide have been used as infrared optical materials. Thallium oxide has been used to manufacture glasses that have a high index of refraction. Thallium is used in semiconductor materials for selenium rectifiers. It is useful for gamma radiation detection equipment. It has been used in the treatment of ringworm and other skin infections. This use, however, has been limited on account of the narrow margin between toxicity and therapeutic benefit. Radioactive thallium-201 is used for diagnostic purposes in nuclear medicine, particularly in stress tests for risk stratification in patients with coronary artery disease (CAD). Combined with sulfur or selenium and arsenic, thallium has been used in the production of high-density glasses that have low melting points, in the range of 125 to 150 °C. These glasses have room-temperature properties similar to those of ordinary glasses and are durable, insoluble in water, and have unique refractive indices. Thallium amalgam is used in thermometers for low-temperature measurements, because it freezes at -58 °C, while pure mercury freezes at -38 °C. Thallium sulfate, which is odorless and tasteless, was widely used in the past as a rat poison and ant killer. These uses are no longer permitted in the United States and many other countries, based on safety concerns. Research on thallium's potential uses is ongoing, particularly to develop high-temperature superconducting materials for such applications as magnetic resonance imaging (MRI), storage of magnetic energy, magnetic propulsion, and electric power generation and transmission. Thallium and its compounds are highly toxic and should be handled with great care. The toxicity derives from the ability of thallium ions to replace other important cations such as sodium and potassium in the body. (These metals share a common oxidation state of +1.) This substitution disrupts many cellular processes. Given their toxicity, thallium compounds were used as rat poisons in the past, but this use has been discontinued in many countries. Thallium was once an effective murder weapon before its effects became understood and an antidote (Prussian blue) was discovered. The distinctive effects of thallium poisoning include loss of hair and damage to peripheral nerves. Victims may experience a sensation similar to walking on hot coals. Contact with the skin is dangerous, and adequate ventilation should be provided when melting this metal. Exposure to soluble compounds of thallium should not exceed 0.1 milligrams (mg) per cubic meter (m³) of skin in an eight-hour time-weighted average (for a 40-hour work week). In addition, thallium is a suspected human carcinogen. Agatha Christie, who worked as a pharmacist, used thallium as the agent of murder in her detective fiction novel The Pale Horse. The first clue to the murder method came from the victims' loss of hair. Dr. Félix-Roland Moumié, a leader of the Cameroonian anticolonial armed struggle against France, was murdered by thallium poisoning on October 15, 1960. A French agent posing as a journalist was the main suspect of this murder. The 1995 film The Young Poisoner's Handbook was based on the activities of Graham Frederick Young, who killed at least three people with thallium in the 1960s and 1970s. Around the same time, an incidence of thallium poisoning was reported in Beijing. The victim's classmate asked for help through the Usenet newsgroup, newly established in mainland China at that time. Worldwide news reports covered the ensuing joint efforts by physicians around the world to diagnose the case. Australian serial killer Caroline Grills was known as "Auntie Thally" for her choice of thallium as an agent to poison her victims. In June 2004, 25 Russian soldiers earned Darwin Awards or Honorable Mentions after becoming ill from thallium exposure when they found a can of mysterious white powder in a rubbish dump on their base at Khabarovsk in the Russian Far East. Oblivious to the danger of handling an unidentified white powder from a military dump site, the conscripts added it to tobacco and used it as a substitute for talcum powder on their feet. In 2005, a 17-year-old girl in Numazu, Shizuoka Prefecture, Japan, admitted to attempting to murder her mother by lacing her tea with thallium, causing a national scandal. ↑ Murder of Cameroonian leader Retrieved December 22, 2007. ↑ Darwin Awards Retrieved December 22, 2007. ↑ Girl admits trying to kill mom by lacing her tea "GaijinPot," April 28, 2005. News Source from Mainich News. Retrieved December 22, 2007. Thallium Los Alamos National Laboratory. Retrieved December 22, 2007. This page was last modified on 23 November 2015, at 16:07.